Yep that’s right folks, Easter is nearly upon us and just look what the postie brought me today! 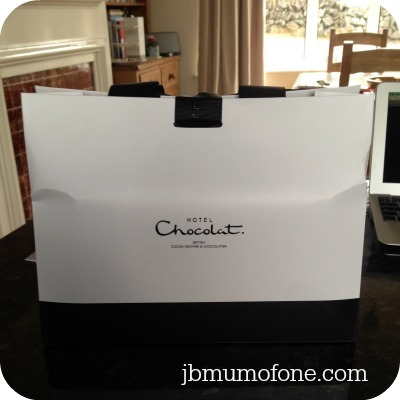 The lovely folk at Hotel Chocolat sent me this package of deliciousness from their Easter Eggs and Gifts range. Oh the irony of this arriving just as I finish cooking up batch after batch of low-fat, high fibre soups for the week. I know, I know, I know I am meant to be on a diet and fitness mission. Shhh! I know. But Easter calories don’t count right? Hope not as I am NOT sharing this beauty with anyone. It is so pretty, so elegant, so grown-up AND it is truly delicious. And as well as the egg there are six super-smooth praline chocolates, which I COULD share…but perhaps not. PLEASE BE AWARE THAT THIS EGG WILL NOT BE WITH YOU BEFORE EASTER! Got it? But won’t it be lovely when this arrives in the post just as all the other Easter chocolate runs out? You can even choose from a milk chocolate egg like mine, a white chocolate egg, a dark chocolate egg or a milk-free scrambled egg. To be in with a chance of winning let me know which of the above you would prefer should you win AND enter via the rafflecopter. Bonus entries can be gained vis the rafflecopter in the usual ways. This competition has been listed on Prizefinder UK, Competition Hunter and Di Coke’s Superlucky Blog. They all sound yummy, but the milk chocolate one gets my vote. Wishing you a lovely Easter. I would love the white chocolate egg! I think it’s got to be the white chocolate egg! Would love the dark chocolate egg please. I would love the White chocolate Egg. Dark chocolate for me please! love white chocolate so no contest really! It has to be milk chocolate. The dark chocolate egg would be my choice. Definitely the dark chocolate one please! I would LOVE the milk chocolate egg please! White chocolate for my child like tastes please! Would love milk choc, but am not fussy with choc so would eat any……!! I would like milk choc! 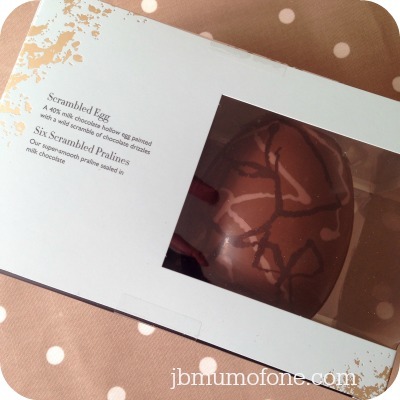 Milk Chocolate Scrambled Easter Egg. would love the white chocolate egg! milk choc is my fave! yummy! Would love to try the dark chocolate egg! Would be a lovely treat after giving up chocolate for easter!! I would love a dark chocolate egg! The milk chocolate one…but I’d enjoy any of them! I would love the white chocolate egg please, thank you for a great giveaway ! Dark chocolate for me – yummy! A Milk Chocolate Egg – Yummy! It would be dark for me. The milk egg would be so indulgent. The milk chocolate egg for me would be so indulgent. mmmm ..Tough decision cos I just loooove chocolate, but milk choccie has to be the yummist. I would love the milk chocolate. Got to be milk chocolate – delicious! Milk chocolate would be nice. milk chocolate please 🙂 yum yum! The milk chocolate one looks gorgeous! I would love the milk chocolate egg! MILK FREE FOR ME …I COULD ENJOY EASTER LIKE EVERYONE ELSE THEN ! Ooh definitely white chocolate. Yum! White chocolate would be lovely. I’d love the milk chocolate one please! I would like the Milk Chocolate. cant go wrong with a bit of milk chocolate! White chocolate for me every time. I would eat any of them but milk chocolate would be my fav. The Milk chocolate egg looks lovely. I would choose the Milk Chocolate. But hard choice. They all sound tasty . Milk chocolate — especially Hotel Chocolat !! The milk chocolate one please. I would love a milk chocolate one – shaken, stirred, scrambled, I don’t mind! I gave up chocolate for Lent and now I’m waiting for that special Egg to start eating again! Milk chocolate would be fabulous! Milk chocolate would be wonderful. A milk chocolate egg – yum! I would love a white chocolate one…yum! The milk chocolate egg please. Milk chocolate would make me very happy! I’d love a dark chocolate one! I would love the Milk Chocolate Scrambled Egg! Milk would be my favourite, I haven’t had an Egg yet not even a bit !! The Milk Chocolate would be lovely! Thank you! I’d love the Dark chocolate one! Chocolate is chocolate. I’m not that fussy! However, my hubby prefers white to all others, so I would like the white one if possible please. But, all Hotel Chocolat eggs are just scrummy. That’s a tricky one, I guess I’d go for the milk chocolate. The milk chocolate would be lush!